← DCCR UPDATE ON PENSIONS IN DETROIT BANKRUPTCY PLAN: VOTE NO! 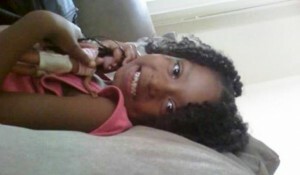 ON 4TH ANNIVERSARY OF AIYANA JONES’ KILLING BY DETROIT POLICE, MORE GRIEF IN STORE FOR HER FAMILY? 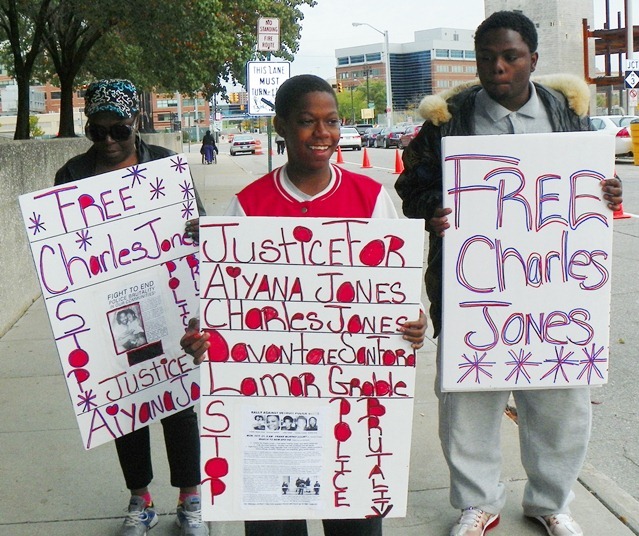 Family members of Aiyana Jones demanded justice for her family and other victims of police brutality during a protest outside the Frank Murphy Hall Oct. 21, 2013. Aiyana Jones in her mother Dominika Jones’ favorite photo of her. DETROIT – As the fourth anniversary of the brutal slaying of Aiyana Stanley-Jones, 7, by the Detroit police approaches May 16, Wayne County Prosecutor Kym Worthy may be planning to bring yet more unfathomable grief to her family. An inside source has reported that perjury charges against Aiyana’s family members who testified during hearings related to the case are imminent. Aiyana’s father Charles Jones was sentenced April 18 to 40-60 years in the killing of Je’Rean Blake, 17, for allegedly giving the shooter the gun involved. Contradictorily, he was acquitted of any weapons charges. He said during his sentencing that he was innocent. “All you’re doing is trying to cover up my daughter’s death because of a reckless officer,” Jones said. “I hope you go after him like you did after me.” He said police have been harassing his entire family since his daughter’s killing. The Blake killing took place two days before the horrific military-style police raid on the sleeping Jones family’s home. Officer Joseph Weekley shot Aiyana in the head with an MP5 submachine gun immediately after entering the house according to testimony at his trial. VOD earlier reported that a source with contacts in the prosecutor’s office said a no jail time deal for Weekley was in the works subsequent to Charles Jones’ conviction. Involuntary manslaughter charges against Weekley would be dropped in exchange for a plea to reckless use of a firearm, a misdemeanor. Wayne Co. Asst. 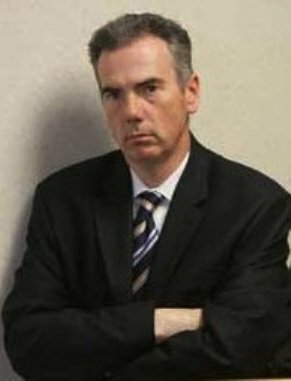 Prosecutor Robert Moran. Today, the source reported that those perjury charges are imminent, expected as early as tomorrow.Prosecutor Worthy is allegedly considering using undated Facebook photos of young men from the family, showing them with guns or facsimiles thereof, to claim family members lied about the presence of guns in the Jones home. The photos were admitted into evidence at Weekley’s trial in August last year, which ended in a hung jury. However, numerous police officers and technicians testified at the trial that the surprise raid recovered no weapons whatsoever from the home or from the persons of family members present. They included Charles Jones, Aiyana’s mother Dominika Jones, grandmother Mertilla Jones, and various uncles and cousins inside and outside the house. Moran, who ironically is the prosecutor in both the Weekley and Jones/Owens cases, objected extensively to the use of the Facebook photos, while the jury was out. 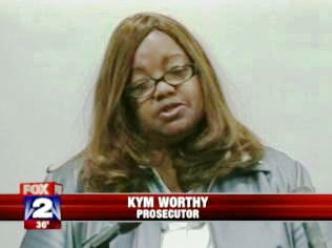 He was overruled by Wayne County Circuit Court Judge Cynthia Gray Hathaway. With the jury present, he hurriedly declared his objection on the record, with no details. Copies of the photos were then distributed to the Weekley jury. 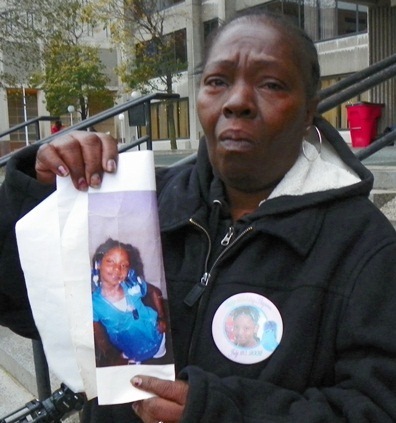 Mertilla Jones during press conference Oct. 29, 2012, shows Aiyana’s photo. Aiyana’s grandmother Mertilla Jones, who was sleeping with Aiyana on a front-room sofa on the day of the raid, and witnessed her brutal death, testified during the trial that she recognized various family members in the photos. She said, however, that she was not sure whether the guns in the photos were real and that she had no idea who took the photos, when, or where. The source alleged that prosecutors are also considering bringing perjury charges against unspecified family members who testified that they had no knowledge of Jones’ presence at the scene of the Blake killing. Only Sherrod Hurt, Owens’ brother, who defense attorney David Cripps said was likely the real killer, and a young classmate of Blake’s who had seen Jones on TV coverage of the death of his daughter testified that Jones was at the scene. Jay Schlenkerman prison photo after latest incarceration in Kinross Correctional Facility. Two jail-house snitches gave the only testimony that he gave the gun involved to Owens. 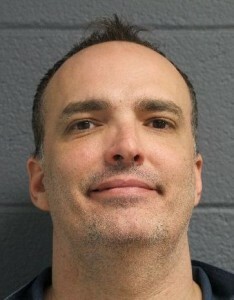 One, Jay Schlenkerman, is now serving a sentence of six to ten years at the Kinross Correctional Facility in Kincheloe, in Michigan’s Upper Peninsula on charges of “Police Officer – Fleeing – Third Degree, and Operating Intoxicated/ Impaired / Controlled Substance, 3rd.” According to prison records, he had ten previous such charges. Owens refused to testify against Jones. During a videotaped police interrogation shown at his trial, he identified another man as the one who gave him the gun. Still in shock from learning that Aiyana died during the raid, he appeared confused and gave several versions of the incident, but never fingered Charles Jones. Detroit Sgt. David Pomeroy and St. Clair Shores Sgt. Michael Notoriano. The source compared Worthy’s alleged plans to charge Jones family members to the perjury charges her office brought against Robert Cureton. 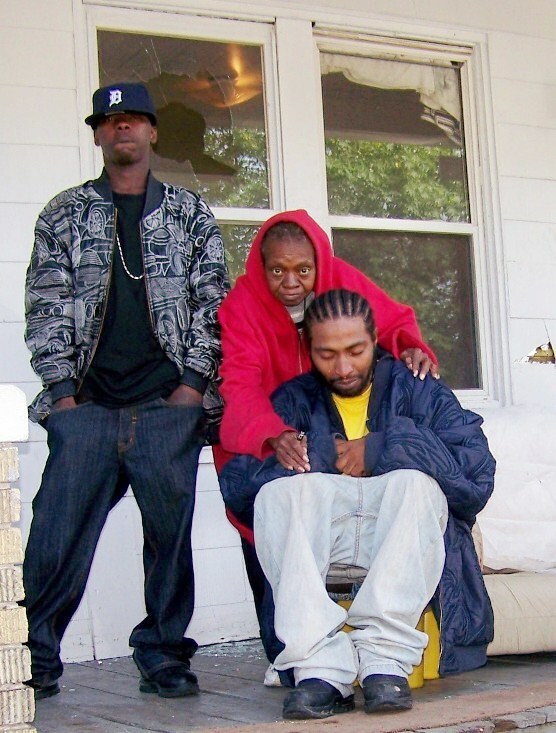 In a well-publicized case, Cureton and two other Detroit men accused two police officers, St. Clair Shores Sgt. Michael Notoriano and Detroit Sgt. David Pomeroy, of armed robbery and felonious assault at an east-side gas station, while they were off duty. See Perjury article. 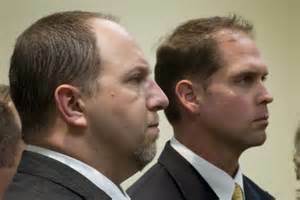 “David Pomeroy and Michael Notoriano – Detroit and St. Clair Shores police sergeants charged with crimes in connection with a an iPhone stolen from Notoriano’s 16-year-old daughter. Today Judge Michael Callahan granted a motion to quash all felony counts against Pomeroy finding that the district court erred in binding the case over. The following counts were dismissed: one count of Armed Robbery, two counts of Unlawful Imprisonment, one count of Larceny of a Firearm,one count of Public Official- Willful Neglect of Duty, and Felony Firearm. The two misdemeanor counts of Public Official- Willful Failure to Uphold the law remain. The court indicated that a stay of proceedings would be granted if the case was appealed. ‘The Wayne County Prosecutor’s Office disagrees with court’s decision today and will appeal the ruling,’ said Maria Miller. Miller had not responded to a request for comment on any pending perjury charges against Jones family members before press time.